Effective communication is a major tool of success and it can help to solve many problems’ said Ambassador Deepak Vohra IFS (Retd. ), Advisor to the Prime Minister of the Kingdom of Lesotho. He was speaking as the keynote speaker in an Expert Talk on 'Effective Communication' at Desh Bhagat University. The lecture was especially arranged for the students to boost up their communication skills and its importance in day to day life. While addressing the students and faculty members, Ambassador Vohra said that Effective Communication is the glue that helps you deepen your connections to others and improve teamwork, decision making and problem solving. It enables you to communicate even negative or difficult messages without creating conflict or destroying trust. He explained to the students that effective communication is a learned skill, it is more effective when it’s spontaneous rather than formulaic. The more the effort and practice you put in, the more instinctive and spontaneous your communication skills will become. He also advised the students to learn few new words every day, speak soft and clear, improve vocabulary, diction and keep themselves updated from time to time. 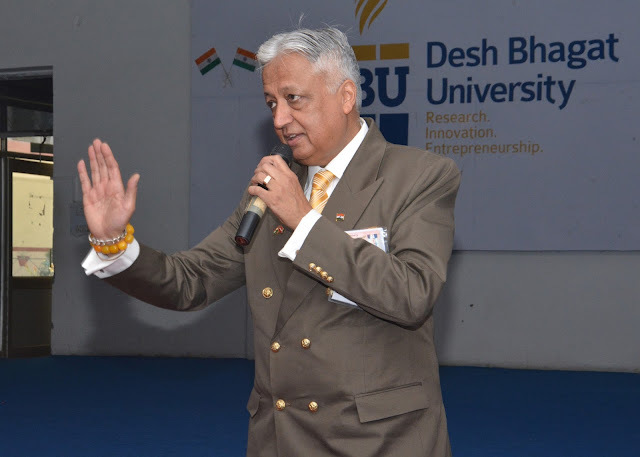 In his power packed lecture, he discussed on several points and shared his views regarding body language, personality improvement, dressing sense, politeness and learning. Mr. B. N. Sharma I.G.P, B.S.F (Retd.) graced the occasion as special guest. He also interacted with the students on important topics and shared his experiences. The students evinced a keen interest in the lecture and during the interaction session, they asked relevant questions on concerned topic which the learned speakers answered to their entire satisfaction. The students said the views expressed by both the speakers have encouraged them to learn maximum. University Chancellor Dr. Zora Singh expressed his happiness and said that such events are very useful for students and this will help in their multi-functional growth. At the end of the programme, Vice Chancellor Dr. Varinder Singh thanked the learned speakers for sparing their valuable time for the students and hoped that it will prove as blessing for them.